Martha Wainwright's new album, Goodnight City, comes out Nov. 11. Courtesy of the artist. In the first draft of her novel Mrs. Dalloway, Virginia Woolf described her protagonist’s voice as having “a vibration in the core of the sound so that each word, or note, comes fluttering, alive, yet with some reluctance to inflict its vitality, some grief for the past which holds it back, some impulse nevertheless to glide into the resources of the heart.” Woolf’s words capture how women’s voices, in particular, can communicate multiplicities. From one breath to another, they may soothe and seduce; assert and hesitate; share tenderness, joy or heavy sorrow. Women shift their voices so adroitly because their lives require them to be responsive. Always themselves — but always showing themselves in new ways — they adapt, and they reshape the world within hearing range. 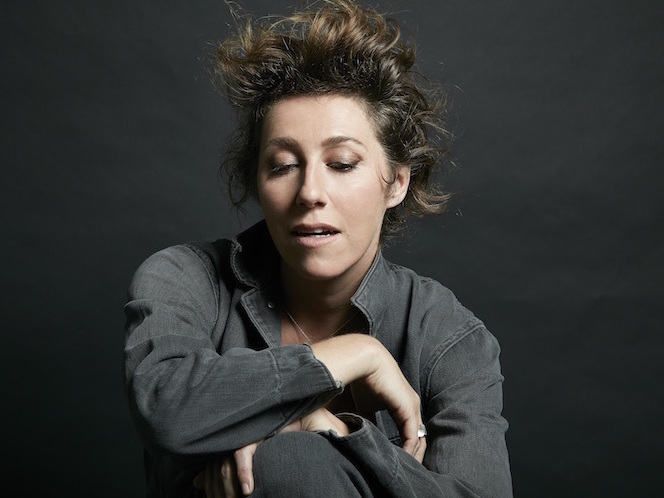 Martha Wainwright‘s singing shows a deep awareness of the meanings that can merge and overflow even within utterances as direct as a lover’s whisper or a lullaby. The 40-year-old songwriter has always been an extravagant vocalist — but an elegant one, too, and sometimes as blunt as a punk singer. On her fourth solo studio album, Goodnight City, she lets every Martha speak: the coy interpreter of Cole Porter and Edith Piaf; the rocker kid smashing through others’ shells; the experimentalist who pushes beyond conventional musical frameworks; the secret sharer, always seeking some unruly revelation. She is bilingual, occasionally switching from English to French in order to access different emotions. Sometimes she goes beyond words altogether. Around the many bends her phrases take, her stories become clear. Some of the songs on Goodnight City clearly reflect Wainwright’s own experience as a mother and a child, a wife and a friend. “Franci” is a sprightly ode to her toddler son: “Everything you do is glory,” the besotted mama declares, then turns on a dime to warn her boy of life’s deep perilousness — as mothers do. The slightly unhinged “Window” expresses the inner conflict of a parent who wants her runaway bunny to thrive in the world, but can’t quite let go; “Before the Children Came Along” recognizes the same manic split in a wife who longs for pure intimacy with her husband while recognizing that those kids who constantly interrupt them are what truly keeps them bound. “Traveller” is an aching folk-rock elegy to a friend whose early death disturbed the ecosystem of her intimates. “So Down,” Wainwright’s foray into New Wave-ish rock, cries out to her own lost self, unrecognized at first, unsure if her memory might be a fantasy. These first-person stories are not standard singer-songwriter confessions: they are deep dramas, imbued with whimsy and dreamlike elements that are heightened by ingeniously varied arrangements by producers Thomas “Doveman” Bartlett and Brad Albetta. Keyboardist Bartlett and bassist Albetta (who is married to Wainwright) form the album’s core band, along with drummer Phil Melanson. Their ease with Wainwright’s hybrid songwriting approach — like her brother Rufus, she works within an ever-shifting palette of classically aware art-rock cabaret — makes the shifting sonics of Goodnight City feel utterly natural. In some songs, Wainwright adopts the perspective of other characters: The woozy woman-under-the-influence ballad “Around The Bend” is only partially her own story, and the playful “Francis” imagines her grandmother wooing her grandfather. Deft cover versions of Beth Orton‘s “Alexandria” and Merrill Garbus‘ “Take the Reins” get at the core of those songwriters’s sensibilities while adding new twists. “Piano Music” sets words by Michael Ondaatje to spare music in a way that perfectly captures that novelist’s poetic style. The other writers who contribute here — Glen Hansard, Wainwright’s aunt Anna McGarrigle and her cousin Lily Lanken — augment a like-minded community of musicians always curious about what new shape a song might take. “Watch out for my white lies,” Wainwright croons in “Around The Bend,” her flutelike soprano forming a melody that twirls like a dancer’s skirts. “Watch out for my creativity.” The woman she embodies in her songs knows that a white lie can turn into a firm belief over time, and that creativity can conceal as much as it uncovers. But she’s always curious to find out what truths may emerge within those vibrations that travel from soul to throat to the world — and how the echoes of a voice finding itself continue to reverberate.